Nowadays mobile is in use everywhere and we have tons of mobile app to make our life easy. MoneyControl is one such app which is very popular among investor and traders. It provides brief stock updates and latest information about companies listed on exchanges. Ever wondered what all that jargon in the app mean? 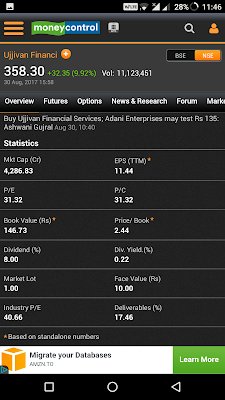 MoneyControl app also provides full information about company financial reports like P/L and balance sheets. It can be easily used as a primary level of research for any company. 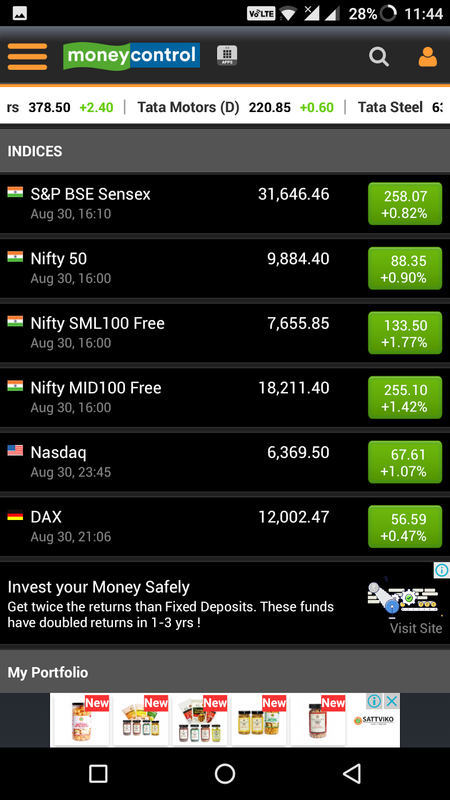 On the home page of MoneyControl, it lists Indian and global indices. 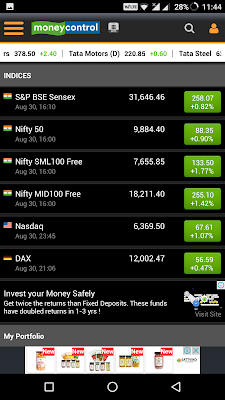 I guess everyone will be familiar with Nifty 50 and Sensex. Nifty SML 100 Free– Index consists of top 100 small cap companies. Nifty Mid 100 Free- Index consists of top 100 mid-cap companies. My portfolio– This section could be used to track all your investments on daily basis. You can add stock, mutual funds, loans and other fixed sources of income. Now let us check the main page of any stock. 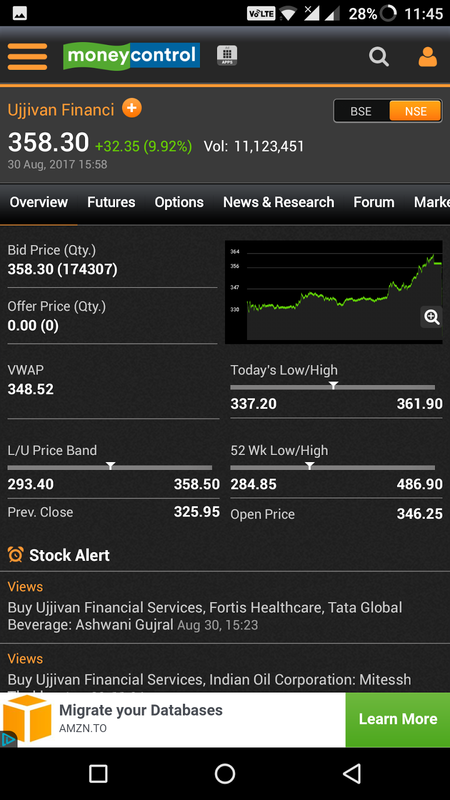 For reference, we will be discussing Ujjivan Financial. 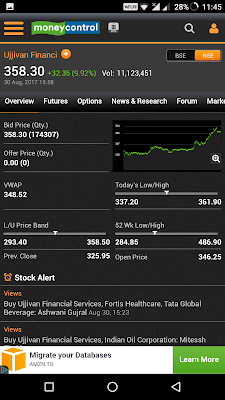 Last Traded Price– It is shown on the top i.e. 358.30. Also known as current market price (CMP). Volume– Total number of contracts traded for this particular stock. Here the value is 11,123,451. Bid Price and Offer Price– Bid price is a price quoted by people who want to buy shares and they are quoting their price and quantity. When bid match with the sellers asks price, the trade will happen. The offer price is the price at which a seller is ready to sell. Note, this data keep on changing per second. Always notice bid is less and ask is high. Because Bidders want shares at low prices and Askers/Sellers want their shares to be sold at high prices. For more information, you should refer Market Depth. Today’s Low/High- this is the maximum and minimum price at which stock traded during the day. L/U Price Band- Lower and upper price band is the minimum and maximum price at which stock could trade in a day. It prevents unwanted volatility in the market. The stocks which are traded in options and futures do not follow circuit filter. 52WK Low/High– It is the maximum and minimum traded price of the stock in a year. Market Capitalization– It is the product of current stock price and total no. of free shares of the company. EPS (earning per share) – profits earned per share. It is calculated by dividing total profits by total no. of shares. It signifies profitability of the company and individual share. P/E(Price to earning ratio)– Refer to the division of stock price by EPS. It signifies how much valuation in the market of the company. A high P/E denotes people are bullish on the stock and are expecting higher earnings growth in coming time. Book Value-It gives a rough idea of the true value of the business. Usually used for financial companies. Dividend Yield– Actual dividend is usually misleading so people use div. yield as a factor to compare stocks and to find total dividend paid by the company over a year. The dividend yield could be calculated as dividend yield percentage of CMP. Market lot– It is generally one for equity shares but few SME companies are traded in some minimum quantity like 1000 or 2000. So an investor/traded can buy in multiples of the market lot only. but it can sell it for more. The difference between what shareholders pay for a share and the face value is referred to as additional paid-in capital. Usually, maximum face value is 10 and minimum face value is 1. Industry P/E– Average P/E of companies in the same sector. Deliverable– Percentage of shares which exchanged hands on a day. 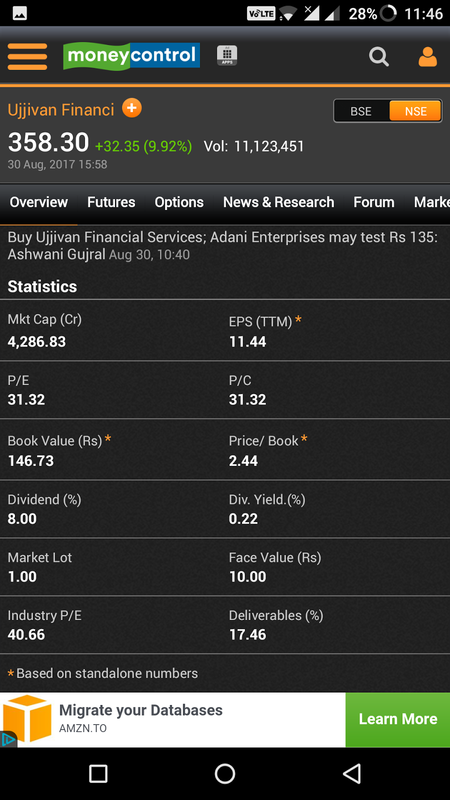 So here only 17.46% shares of total volume exchanged hands and rest were only traded during. I hope this brief article has helped you in increasing your understanding of using Moneycontrol app.